McCormick Place is one of the largest convention centers in the Chicagoland area. Consisting of four buildings and one arena, McCormick brings thousands of people through the doors to be entertained. The Wintrust Arena was an expansion to the McCormick Place done in October 2017. Specialized LED displays, Broadcast Cameras, and a fiber optic backbone integrated to provide an enriching experience for the 11,000 seated during sporting events, concerts or other live shows. 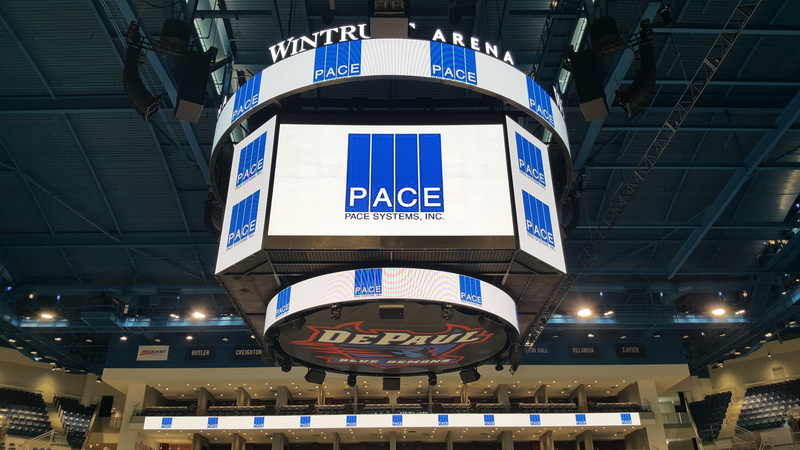 Pace Systems assisted in designing a solution to enhance attendance and provide an exhilarating experience. PACE installed 200,000 feet of single mode fiber and 100,000 feet copper connectivity to provide a richer broadcasting through sound and cameras. Multiple large format LED displays on the interior and exterior walls of the arena provide patrons a unique viewing experience. In addition to the AV, Access Control and CCTV systems were installed for premise security. A fully functional, multi-purpose world-class Converged Technology Solution was delivered on-time and under-budget, allowing Pace Systems to maintain a successful, continued partnership with McCormick Place. This project and several others have produced functional, scalable, affordable solutions that continue to bolster the Chicagoland area’s technological landscape.